It will be a challenge to raise corn and soybean yields to feed 9 billion people with a higher standard of living by 2050. Experts say it will take a combination of genetics and management to increase yields. Most of the first biotech traits have been defensive traits that protect yield to allow corn to express more of its full potential, says Roger Elmore, Iowa State University Extension corn agronomist. Increasing yield corn involves a more complex set of traits, he notes. Although hybrids were introduced in the 1930s, Elmore says that was not the only factor that increased yields at that time. He says inorganic fertilizer and better planting and harvesting equipment allowed farmers to push higher populations. Plant populations have increased from 12,000-16,000 plants per acre in 40- to 42-inch rows to up to 35,000 plants per acre in 30-inch rows, Elmore says. Plants have been bred to withstand the higher populations over the years. However, he wonders how many plants can be in a 30-inch row? Some breeders are working on hybrids that can withstand higher plant populations. The winners in the National Corn Growers Association corn yield contest are getting yields of 350-400 bu./acre, Elmore says. If the national average was 85-90 percent of that, he adds that would mean an average yield about 300 bu./acre. Using current yield trends, he says it will take until 2080 to reach that yield level. However, he notes it is harder now to get yield increases than it was five years ago. In addition to increases from better breeding, Elmore says there will be better production practices. He says it is likely other improvements will help increase yields. By 2050, he says it is likely weather forecasts will become better and help farmers better match genetics with weather. That shows the need to fund production practices because corn-yield increases likely will be a combination of improved genetics and production practices. Seth Naeve, University of Minnesota Extension soybean agronomist, is among a group of specialists looking at ways to increase bean yields. He says soybean yields have increased as much as corn yields on a percentage basis. 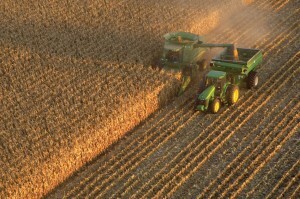 “Most of the frustration is because of the nice corn yield increases,” he says. Naeve says there are genetic challenges that make increasing soybean yields harder than corn. The limited amount of difference in genetic diversity in soybeans is a bottleneck to increasing soybean yields, he explains. Dealing with the different maturity groups is another complicating factor in breeding soybeans, he adds. Naeve and other soybean specialists have started testing production practices to increase yields. The project is funded by the United Soybean Board and started after Missouri farmer Kip Cullers recorded soybean yields of 122 bu./acre. “People started to see there was potential there,” Naeve says. While he tested many different production practices, he has only been able to increase yields 4 to 6 bu./acre, similar to what many farmers have seen on their farms. “We weren’t able to double yield,” he says. Naeve says the project now has nine states. It started with six states. One goal of the project is to test and get more uniform production-practice recommendations throughout the country to reduce confusion, he explains. However, one of the main goals of the project is to educate graduate students in soybean production, he says. Naeve agrees with Elmore that increased yields will come from production practices and genetic improvement. It takes investment for genetic improvement. “We got to have that investment,” he notes. Philippe de Lapérouse, managing director at HighQuest Partners, says the recent boom in agriculture has brought venture capital into early stage life-sciences companies. HighQuest Partners is a strategy consulting firm that holds a global ag investing conference. Interest among investors in agriculture and life sciences has increased at the company’s conference to where they have added one day to the event for companies to network with investors, de Lapérouse notes. He expects technology transfer to grow around the world to reach higher yields.